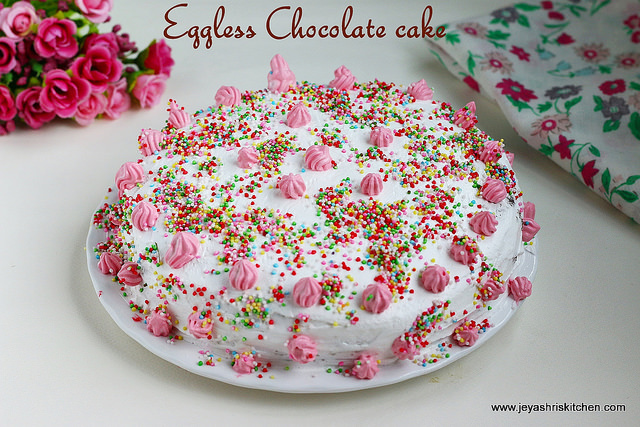 I am so delighted to present this Eggless Chocolate Cake on this special occasion . Jeyashri’s Kitchen is turning 5 today. 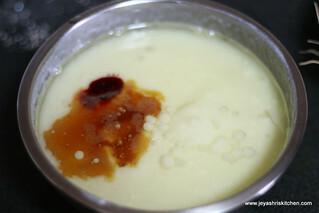 Five years went so fast and i still recall the first day i posted the recipe of Paal payasam ,the same day. 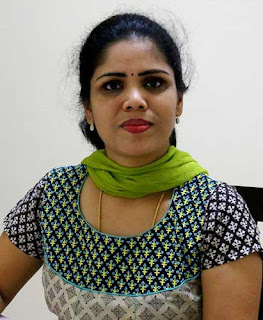 In this journey of blogging for 5 years , i have gained so many friends and very good readership too.This journey was so successful, with the fullest support from my family. They always encourage me in all the things i do and celebrate my success . I thank all my readers, my friends, co bloggers from the bottom of heart and wishing that will continue in the coming years too. With all your support i have reached this milestone. Special thanks to Raks , Nags and Shriprada for their continued support in the technical aspects of blogging. Very happy to have nice friends around me always. 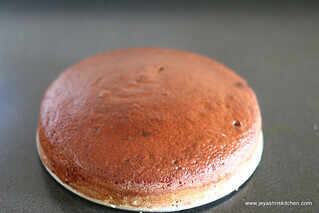 I used my Eggless Vanilla Sponge cake recipe for this recipe by just replacing a portion of flour with cocoa powder. I have no clue about the icing . 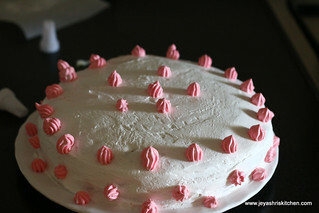 My reader who started a blog also now, gave me all ideas about icing. Thank you so much Sujatha ram of Indian veg kitchen for clarifying my silly doubts and guiding me even in buying the ingredients for icing too. I am trying this same cake for the second time. I made this 2 months back for our wedding anniversary. 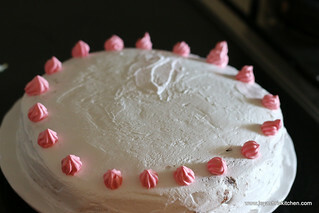 Scroll down the recipe to get more tips in baking cake and icing tips and also for a guessing game. 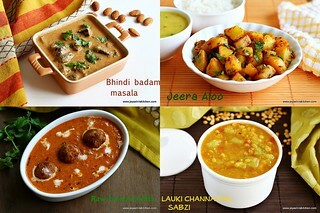 I am planning to share Lunch menu Ideas on every Saturday on my Facebook page . 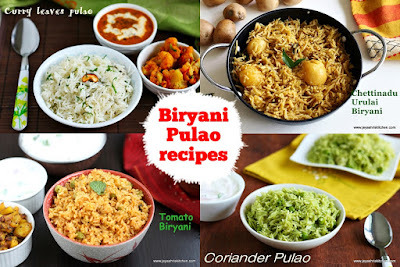 I am getting requests from readers to post lunch meal plans but already i am posting Indian Kitchen basics, Microwave cooking and Bachelor cooking recipes on weekends. 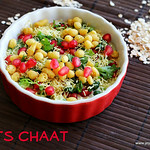 So follow Jeyashri’s Kitchen on facebook for Lunch menu ideas . 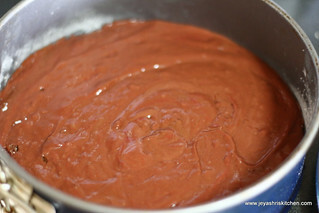 Sift the flour, cocoa powder, baking soda and baking powder so that they will be mixed evenly. 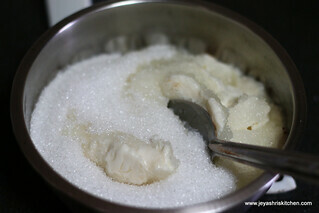 In a separate bowl, add the yogurt and sugar and allow the sugar to completely dissolve . 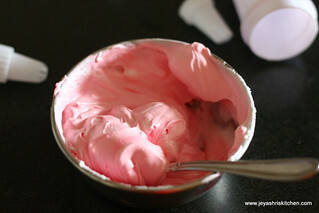 When dissolved, add the oil and the vanilla essence and the red food color. Adding red colour is optional. I wanted to make a red velvete cake, but unfortunately it didn’t give out the red colour. 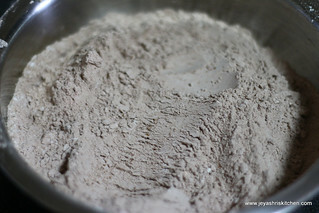 Mix well and slowly add it to the sifted flour mixture and mix well. Preheat the Oven at 160 degrees for 10 minutes.. Grease the cake pan and dust it with some flour. Pour this cake batter to the cake tin. Bake this for 35 to 40 minutes. 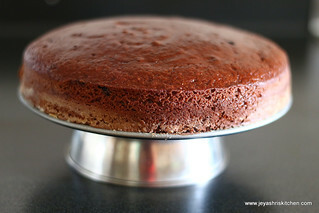 Insert a tooth pick to the centre of the cake and if it comes out clearly the cake is done. Allow this to cool completely and put a cling wrap on this and keep it in the refrigerator for 4-5 hours. Let us make the icing. Before that keep the Whipping cream in the freezer for 15 minutes. 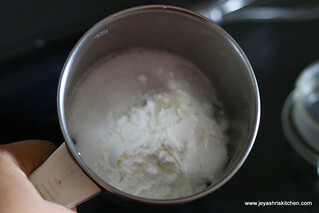 Also freeze the vessel in which you are going to whip the cream.Keep the blades too in the refrigerator. 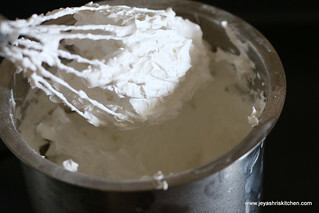 Always use a tall vessel or a wide bowl, so that the cream will not splutter while whipping. Powder the sugar and cornflour together, if using icing sugar no need to powder it. Whip the cream till it forms a soft peak. Mine took 8 minutes. I used the REDMAN brand whipping cream which we get here in Phoon Haut shop. I used my electric hand blender. After that add the powdered sugar mixture to this and beat well. If adding agar agar powder, add now. Agar agar gives firmness to the icing and will not melt even if it kept in room temperature. 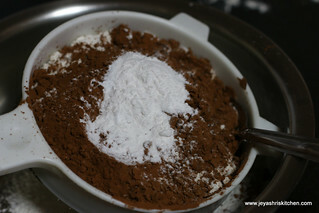 After adding sugar mixture the cream will become more firm too. Till you start the icing keep the mixture in the freezer. When you are ready to make the icing, take out the cake from the refrigerator and place the cake in a plate and keep it on a inverted bowl. 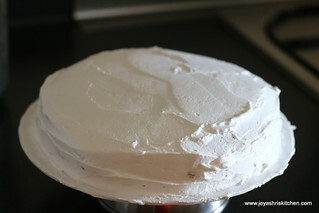 This step is to make the cake easily movable while doing the icing. Hold the plate in one hand while doing the icing. 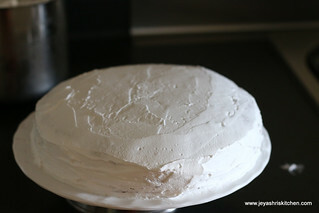 Using a spatula or a butter knife start doing the icing. Put a portion of the icing mixture on the top of the cake . Spread the mixture evenly with a spatula. 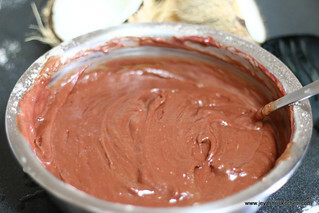 Carefully spread first on the top and slowly do it for the sides. Mine was bit uneven as i was doing for the first time. Wipe out the extras spread on the plate and keep this cake with icing in the freezer for and hour. 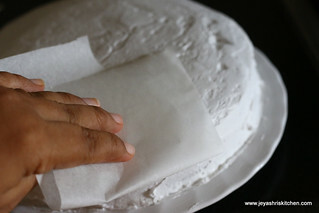 This will be dry now and using a butter paper level the cake to get a clean even look. I decorated with the cake in a very simple way. I used a icing nozzle and filled up with cream and did some decoration. I used the food colour which i used for the cake. 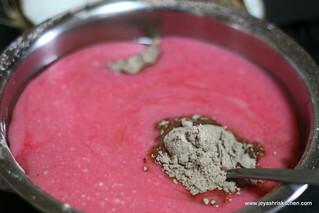 Take 3 tblp of cream in a bowl and add a drop of the red cherry color to this and mix well. Fill this mixture in the tube and cover the piping tube. Feel free to do the decoration according to your won imagination. I used some colored sprinkles to fill the gap. Slice the cake and enjoy the cake. 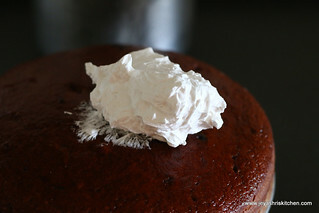 The cake was spongy and it tasted so yummy with the whipping cream icing. 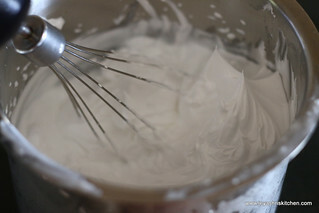 Always keep the whipping cream, the vessel you are using to whip the cream in the freezer for 15 minutes before whipping. 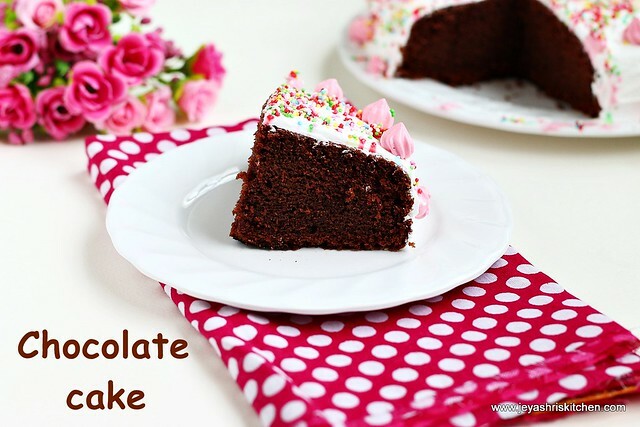 Do not do the icing on the cake when the cake is not cooled completely. 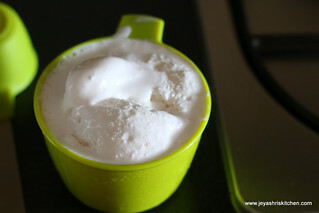 Use electric hand blender to beat the cream, mixie will not work out for this. 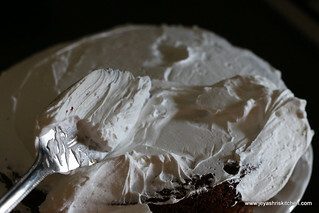 If making cake on a peak summer season , keep the bowl on a ice cubes and then beat the cream. Once the cream forms a soft peak stop beating this as it is ready for icing. Over beating of cream make it loose. While baking the cake do not open the door of the oven for the first 10 minutes. This will make the cake sink in the middle. Congrats and thanks for sharing . Congrats on 5 yrs of successful blogging!! Way to go Jey!! The cake looks so tempting!! Congrats great work. 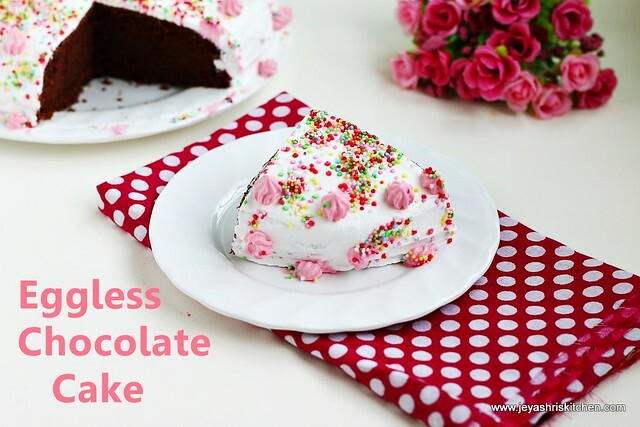 Nice cake recipe. Superb cake.Apt for celebration. Keep rocking :) Congratulations ! Congratulations and lovely cake to celebrate the occasion..
Congrats and wish you many years of successful blogging!! congrats jeyashree n keep posting ......u deserve this cake. Congrats on the milestone. Cake looks delicious, perfect for the occasion. Congrats, cake fantastic like ur blog. 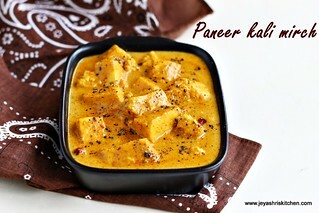 Congrats Jeyshri.You keep me inspired through your recipes .Lovely presentation. Jey is it palkova or pedas you made with the remaining cream? Congrats sis... Great going and wish to achieve more and more... N with leftover cream any mousse..?? Congrats and cake looks very lovely! Nice cake. Loved the clicks. It was awesome. The cake looks fabulous. 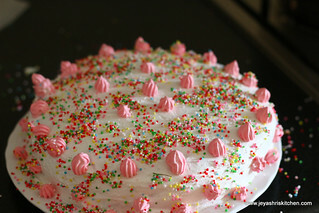 Congratulations Jeyashri.. Cake looks awesome..
Hai can I make this cake in microwave oven ? .shall I use normal cream and also tell how to use in normal cream? Can I use butter instead of oil and of yes how much butter ? Also did you use the red food colour before adding the other liquids . What type of icecream, could u post it? Congrats for turning to 5! 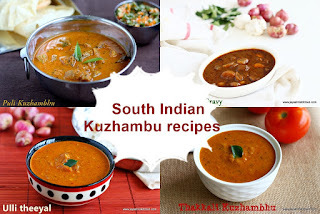 Could u post regular sambar without grind paste? Vishnupriya, ice cream will be posting soon. 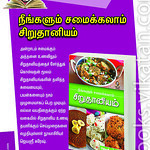 Reg, sambar i have drumstick sambar without any ground masala. Please check my recipe index. 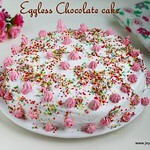 Looking yummy.. Chocolate cake is favorite of mine and it is without egg means it’s too good. 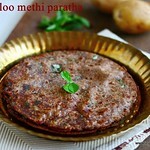 I will try this recipe on this valentine day. Your cake is superb I am planing to prepared cake to my friend on his birthday.I have few more cakes in this website ; online cakes delivery. which one is better. I will be trying your cake just had a few of questions, can I use local white butter (makhan available at local dairy outlets) instead of oil. Also instead of normal sugar can I use castor sugar. The measurement of a cup is equal to 200 ml. Do let me know if these are alright. Hi mam!!! 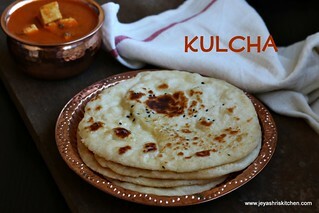 Great recipe...I tried this recipe and it came out really well... But then i have a small doubt.. Incase we are using icing sugar..how many cups should i use for 3/4th cup of whipped cream??? Mam can u please tell me why there is a need of adding cornflour to it?